This office is in receipt of an autographed copy of your book entitled “The Man Who Killed Lincoln”, addressed to Mr. Pitts. I am very sorry to advise you that Mr. Pitts died of lobar pneumonia on December 12th last after an illness of two weeks. The book and your letter to Mr. Pitts will be turned over to his widow upon her return from Florida where she has gone for recuperation. I don’t know how long Edwin Pitts was employed in the JAG office, but from the above pictures it appears that this civil servant died a bit before his time. Au Revoir, Mr. Pitts and thank you for keeping an eye on the assassination relics during your tenure. Not all the items in the above list are correctly identified, though. The biggest one would be Powell’s knife which was not in the posession of the JAG’s office since it was given to Private George Robinson in 1867. Still it’s clear that Mr. Pitts was the go to person in the JAG’s office when it came to the relics of the conspirators. Wonderful memory, Wes. 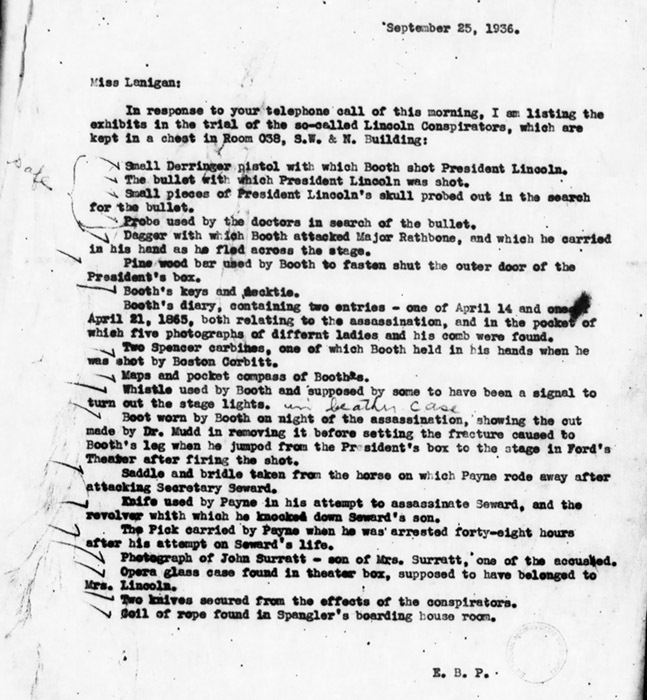 I updated the post and included the Lenigan letter from 1936 that bears Pitts’ initials. I don’t have the 1933 transfer list to NPS. Could you e-mail that to me when you get a chance. Thanks. It would be interesting to know if Mr. Pitts was a native of Prince George’s County, Maryland. A family by that name had a home along the escape route of Booth – between Surrattsville and T.B. – when I was a child. I never knew, however, if their family was originally from the area (or just transplants to serve the U.S. government). The house was torn down in the 1960s, I believe, and a modern structure now stands on the site. My mother’s last name is Deringer and my great times x (5 maybe?) grandfather is Henry Deringer. I kind of always thought, what a thing it would be to own this gun. Morbid but true. This deringer is undoubtedly the most famous of your gr-grandfather’s namesake weapons.